Recorded Books, New York, 2008. 7 compact discs. 7.75 hours. When The Graveyard Book came out, I checked it out for my 14-year-old son to read, knowing he'd want to read anything by Neil Gaiman. He told me I should read it, but after listening to Coraline, which was very good but exceedingly creepy, I decided that a book by Neil Gaiman with "graveyard" in the title was bound to be too creepy for me. The premise, and the reason for the name, is the same idea as The Jungle Book, except instead of a baby being adopted by the dwellers of the jungle, a baby is adopted by the dwellers of a graveyard. The book does begin as a family has just been murdered. The killer is looking to finish the job, but the baby has toddled off. In the graveyard, a loving woman who always wanted to be a mother convinces her husband to take pity on the baby and take him in. As Mowgli's parents needed the approval of the pack, so this baby needs the approval of the inhabitants of the graveyard. He's named Nobody Owens, Bod for short. There are some fun parallels between Bod's story and The Jungle Book. For example, instead of getting kidnapped by apes, Bod gets kidnapped by ghouls. At first the book seems very episodic (with extremely interesting episodes), but by the end, all the adventures tie together into Bod's need to avenge his family, escape their fate, and live a life outside the graveyard. 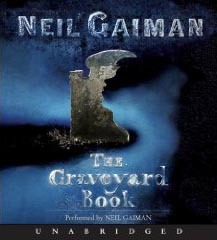 Neil Gaiman's narration is simply awesome. He now lives in America, but he has a wonderful voice and just enough British accent to sound incredibly cultured. He gives the different characters different voices, with accents as appropriate. I found his reading of the chapter with the ghouls especially delightful. Although I'm sure this book makes great reading on your own, hearing Neil Gaiman read it makes for an incredible listening experience. I found myself lingering in the car more than once because I got to work too quickly.